An overnight train journey from Bangalore brought us to Hospet, and within minutes of getting off the train, we were on the road to the Sloth Bear Resort. 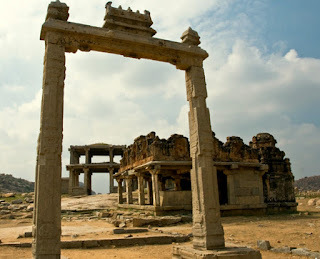 This was my first visit to Hampi and as cliché as it sounds, in many ways it was indeed “a dream coming true”. The 17kms to the resort was along a road filled with trees, and fields on one side, while there were rugged mountains on the other. Upon seeing the board “Karadi Cafe” I knew we had reached the resort. Our cottage was tucked away behind the dining area, and the winding up had quite a rustic feel to it. The room was fitted with all amenities we could want, and had a balcony to sit and feast on the sunrise or sunset. We ordered a cup of hot tea, and that was all it took to have us refreshed and ready to explore the property. We also met the naturalist Virupaksha, who promised to take us birding within an hour along the river Tungabhadra. This time eyes tuned to the vast open space around us, and ears sharp waiting for a bird call. In that one hour, we spotted quite a few birds- kingfishers, Sand piper, quails, grey heron, parakeets, Purple heron, and Hoopoes wandering near the canal. 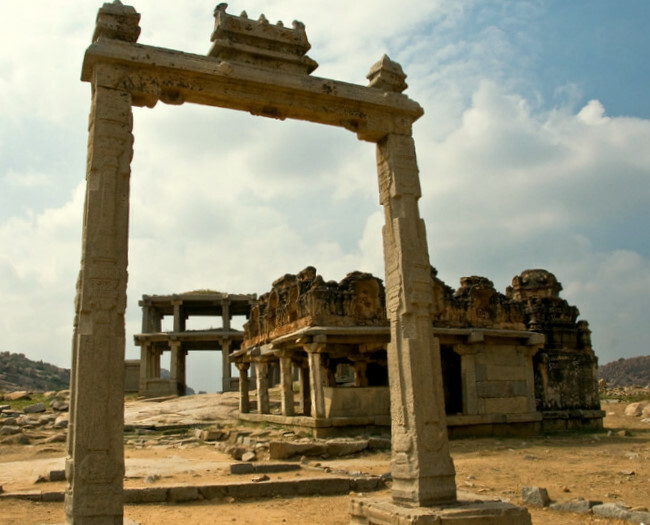 With just two days, we wanted to see as much of Hampi as possible. Next on the agenda I was told was the visit to the Sloth Bear Sanctuary in Daroji which is where the resort draws its name from. I had seen pictures of the bears lounging on the rocks, and to think I was going to be seeing them in real had me excited. We drove into the sanctuary, watching a wild boar cross ahead us, before driving ahead and parking the jeep near the rocks where the bears would come. We didnt have to wait more than a few minutes, and we saw a bear stroll along towards us with two cubs in tow. Soon, there were quite a few and all they were focussed on were the sweet licks on the rocks. Did not pay any attention to us, but went about lapping up their treats. The bears soon made their way along the path towards the exit of the enclosure and we drove along, capturing them. It was wonderful to watch a mother bear protect her cub from a male that came hovering about, two bears fight for the patch of rock and how at ease they were around humans. The sun set as we drove out back to the resort, while the bears lingered on my mind. I was already looking forward to many more treats in store at Hampi. 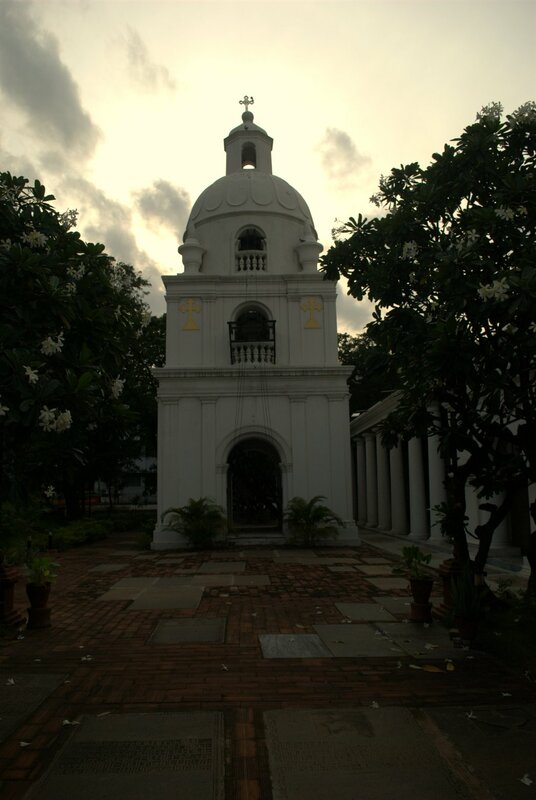 And finally, i was headed towards Armenian Street across from the High court to explore the Armenian Church. It had been on my mind forever, and to think i was standing at the door talking to the security guard about the place, it felt surreal..
Once upon a time, Chennai was filled with Armenian merchants, but today, only stories about these traders remains... The only trace of Armenians is the church and the Cemetery around on a street named after them. After visiting the most popular sights in Goa- exploring Fort Aguada, strolling along the Anjuna Beach & the flea markets, going on a Dolphin cruise, and exploring Colva beach where I managed to let go of my fears and go para sailing, I was now eager to explore the other side to Goa- The Old Goa as it is called. Also known as Goa Velha ["Velha" in Portugese means Old], it is located on the banks of the River Mandovi about 9 Kms Panaji, Goa's Capital. Riding the bus to Panaji, I chatted up with the lady sitting beside me asking her if she knew anything about this part of Goa. She went on to tell me that the town was once a major Portuguese stronghold and before that was the capital of Bijaipur Kingdom as well. But apparently, most of the forts, weaponry, and traces of the era gone by have gone missing with time. Even though there has been a decline in heritage over centuries, the town is well maintained, inspite of the large influx of visitors year round. "You should explore the churches and temples there" she said before going on her way. I got off in Panaji where the tour guide reccomended by a friend waited. He took over from where the lady had left off to shed more light on the history behind Old Goa. "The town was earlier surrounded by a fortified wall with barracks, a hospital and the prison. Europeans who ruled the region have left behind quite an impression apart from architectural marvels. I will show you some of the famous churches in this region for you to understand better." Within minutes we were on a road flanked on either side by a Grand church. 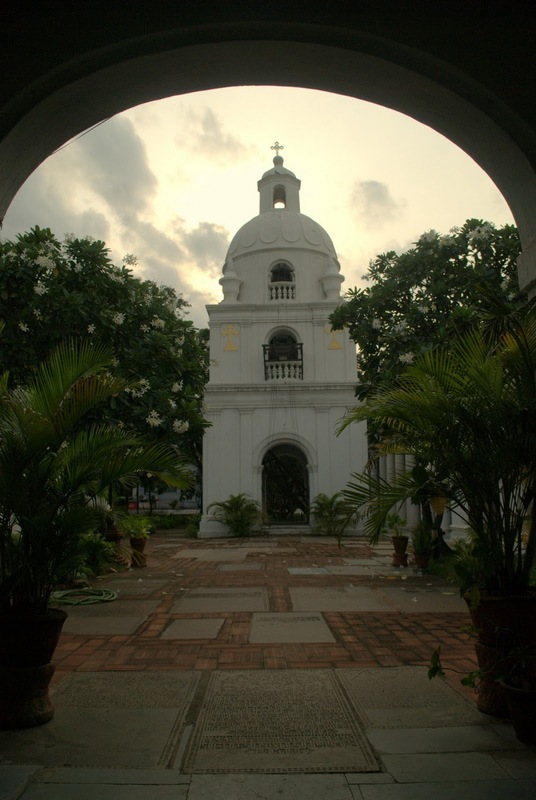 "On your right is the Basilica of Bom Jesus and across the road is the Se Cathedral. Why dont you go explore the Bom Jesus Basilica first?" he said before wandering off to chat with some friends. Basilica of Bom Jesus is a Church marked as a World Heritage Site standing tall but without a towering cross on top. Apparently in its place was a Hindu temple which the portugese demolished to erect the church on.. And the cross they installed kept falling off due to natural calamities, till finally they realised something bigger was in power there and so the church stands tall without a Cross. The interiors are overwhelming, huge ceilings, beautiful art work.. its absolutely breathtaking. The church houses two chapels, a main altar, a sacristy and a belfry at the back. Apart from these, the church also has a rich collection of paintings related to various instances from the life of St. Francis Xavier.Altars dedicated to St. Michael and to Our Lady of Hope are also present. The church houses the sacred relics of St. Francis Xavier, patron saint of Goa. St Francis Xavier is also known as "Goencho Saib" meaning "Lord of Goa". The saint died while on a sea voyage to China on December 2,1552. In accordance with his wishes , his remains were transferred to Goa the following year. Before I knew it, nearly an hour had passed. Making my way out onto the street to explore the Se Cathedral I noticed the guide lost in conversation.